WMS Gaming have never really been my thing in the past. Even the slots that were world famous never quite sat right with me. Slots such as the medieval-themed Black Knight and the martial arts-based Bruce Lee were raved about by many players, but I just couldn't get into them. That opinion has changed in recent times with the release of the colorful Wizard of Oz – Wicked Riches slot and the behemoth Zeus III. I thoroughly enjoyed both slots and the fact Raging Rhino instantly has the same feel as Zeus III with its 6 reels bodes very well for my continued burgeoning relationship with WMS Gaming slots. 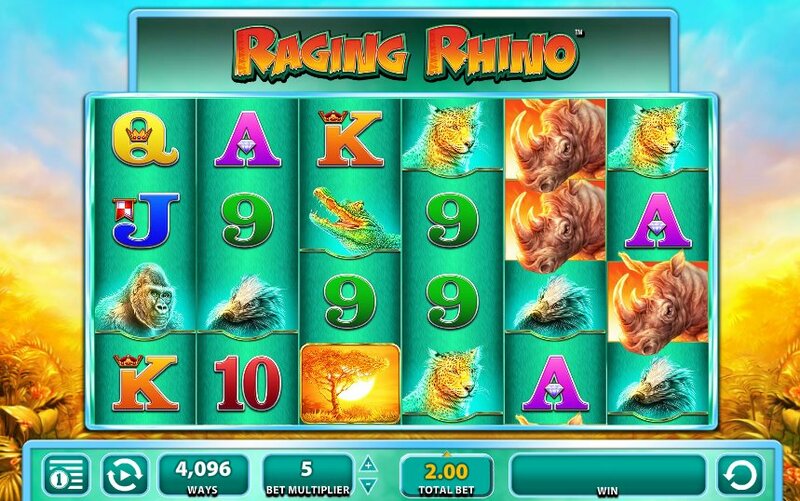 Raging Rhino is a 6 reel, 4,096 ways to win slot that really does take slots gaming to the next level. You really have not seen a slot like this before. It appears that WMS Gaming, through their Williams Interactive subsidiary, have taken Zeus III, given it steroids and released the kraken of slots. It is possible to play from 40p per spin up to £60 per spin so there is some really big cash to be won on this slot. The wins might not be as frequent as they are on other WMS Gaming slots but they won’t half be worth it when they do come. The symbols on the reels consist of various animals from the Serengeti such as rhinos (obviously), cheetahs, alligators, mongoose and gorillas… oh… wait… maybe it’s just wild animals then! The Wild symbol is represented by a Serengeti tree and substitutes for all other symbols, except for the Scatters, to complete winning combinations. The Wild also changes into a 2x or 3x multiplier when it forms winning combinations so your wins are multiplied. This Wild only appears on reels 2 and 5. This slot is all about the free spins bonus round though. This is triggered when you hit three or more diamond Scatters across the reels. The number of free spins you are rewarded will depend on how many Scatters you hit when the free spins bonus round is triggered. Three Scatters will see you get 8 free spins, four Scatters will reward you with 15 free spins, five Scatters will earn you 20 free spins and an incredible six Scatters will win you 50 free spins. It is also possible to re-trigger the free spins so those are the minimum free spins you can expect to get. 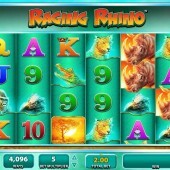 Raging Rhino is a great example of how 4096 ways to win can be a winning formula for an online slot machine. It certainly joins the ranks of IGT’s Egyptian-themed Cleopatra, Aristocrat's Buffalo, Novomatic's Book of Ra Deluxe and BTG's Bonanza as 'game-changer' slots that have left a huge impression with players and the wider industry. This isn’t just another online slot release from WMS Gaming, this is one that will be played over and over again. That being said, players should be warned that Raging Rhino can be brutal at times and you should treat it with a lot of respect. You can very easily lose your shirt trying to chase those elusive scatters, so keep that in mind when you play. I am very much looking forward to the Raging Rhino Megaways slot, which is expected in June 2019.